For the Indian Cooking Challenge this month, we went on to make the Bengali Special Sweet Pati Shapta. 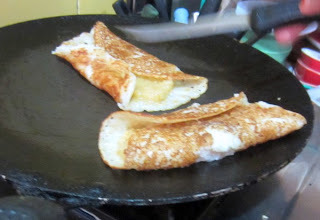 This is a sweet that Bengalis make during the January month for Sankranthi. 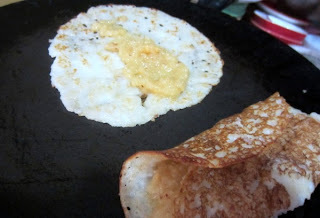 I selected this recipe from Sandeepa's blog and she has pretty much given it clearly. For a change this sweet is not entirely made with paneer, though it does still deal with milk product. And they also use Date Palm Jaggery. If you are not able to get it, use regular sugar. Though we have to make it at home, and most times the measurement would be for a large crowd and I end up scaling down for a smaller number, for my ICC members, this time though I had the measurement for a smaller number, I had to scale up for 100 folks. 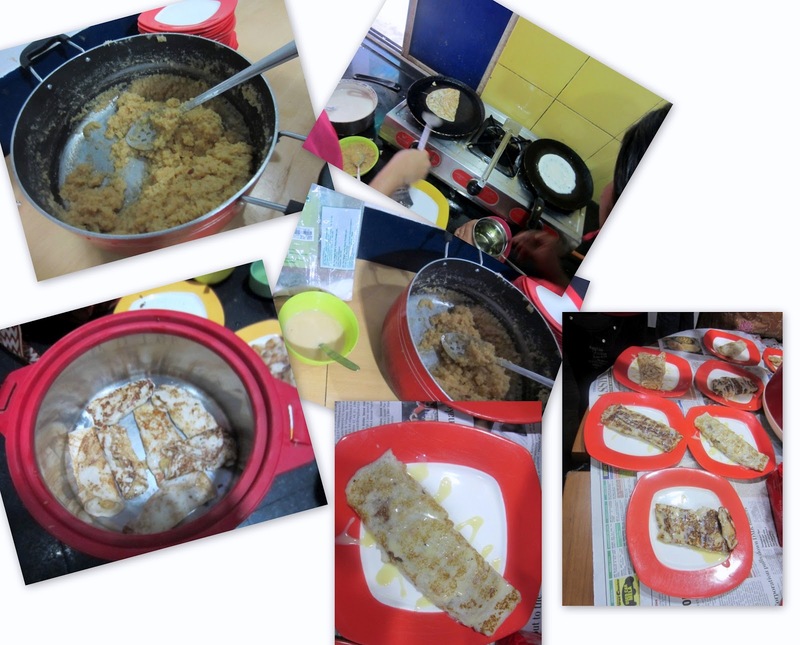 We had a food festival at office and we decided to select a dish from Bengal. Since we have a Bengali colleague, we were able to get the authenticity of this dish when he tasted. He was so elated tasting it that he called up his mom and shared the pictures we clicked. We asked this bengali colleague for recipes that we can make and he came up with two of them. Since he wasn't sure of the measurement, I ended up referring Sandeepa's space. She had given measurement with 3 cups of All purpose flour, I think it makes about 8 pancakes. So I had to scale up to 100 folks or rather 140 - 150 pancakes. After a period, we couldn't keep count of the pancakes that was made. I was suppose to make the filling the previous day. But somehow ended up making it the morning. 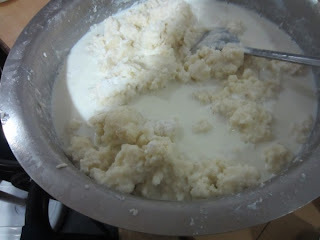 As I wanted to make the filling the previous day to reduce the work on the actual day, we bought the khoya the previous day. Which actually worked out good, because on the day we made I felt we needed some more khoya. 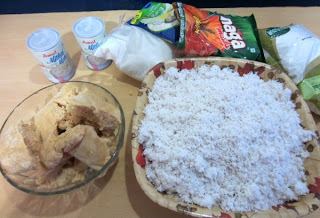 I wrongly calculated the to be about 6 kgs, but when we opened it up for mixing, realized that 3 kgs should work out fine. 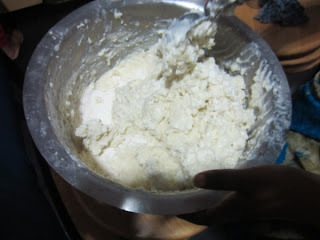 We decided that we can mix later if needed as the batter didn't need any resting period. Another mistake was forgetting to boil the milk ahead of time. 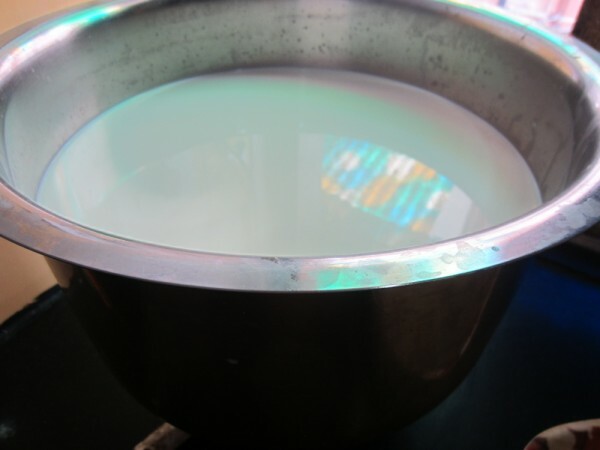 So the milk was really hot when we set out to make. So imagine handling the hot milk with flour. 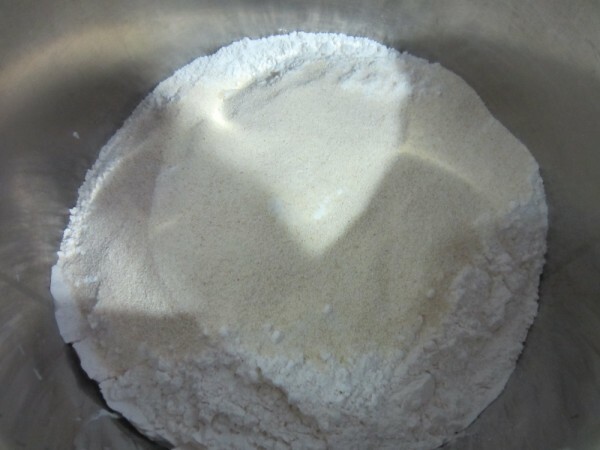 The flour almost ended up being cooked, but we manage to salvage the best we could by cooling the batter and blending it with blender. The khoya got ready and we set it out for cooling. We had about three tawa cooking, with 4 different people making it. The pancakes were supposed to be made, and then the filling to be place over it and again cooked. 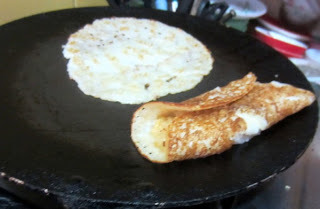 At one point we felt making the pancakes at one go and then topping it with filling was fine, then we saw that the resultant Pati Shapta wasn't as tasty. The first ladle of batter I poured in, turned out to be a mess and a mass! It won't come out at all. Imagine the pantry had about 7-8 of them, looking eagerly at me, they almost had me panicking. The first thought on all our minds was about what we were going to going to serve for the whole lot. 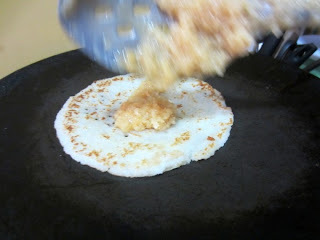 Then knowing it has to be fixed, I mixed in more rice flour and ground rava for the pancake. 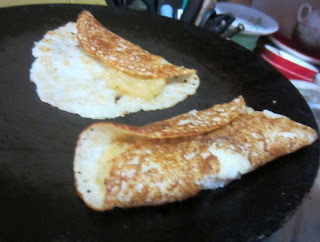 Finally we had the pancake turning out well and the dish turned out awesome! Everybody simply loved it and some liked it with the condensed milk, some felt it added more sweetness. On the whole the team that made the dish were so happy knowing it turned out good. It was really such an unexpected turn out of a success from a moment when we thought it was going to be a flop. From all my experience of making for 100 folks, this was the one dish that unanimously had everybody loving it. Khoya added to the hot pan. 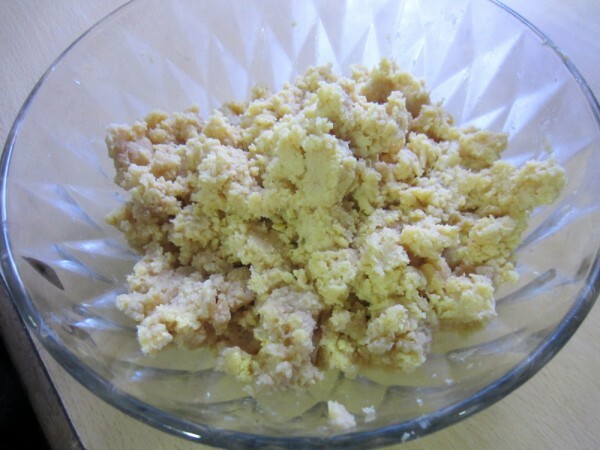 If the khoya is hard to handle, microwave for a minute. This is after 30 mins. 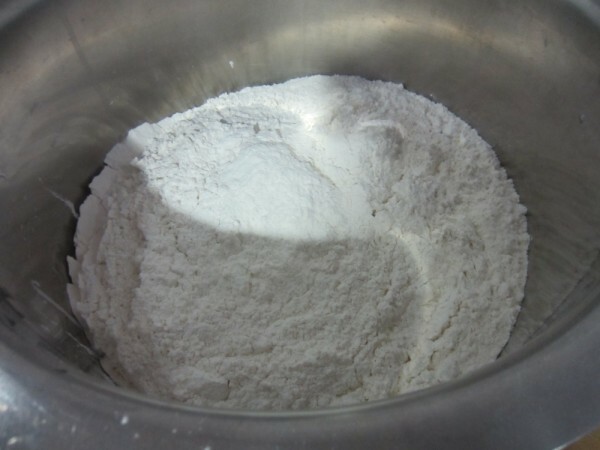 Mixing in the milk and flour for the pancake. Filling up at the same time. Sugar / Date Palm Jaggery - 1 cup. Take the fresh grated coconut and sugar, mix well using your hands so that the coconut gets soft. Then put it on heat, and mix using a ladle.Simmer though the whole process. 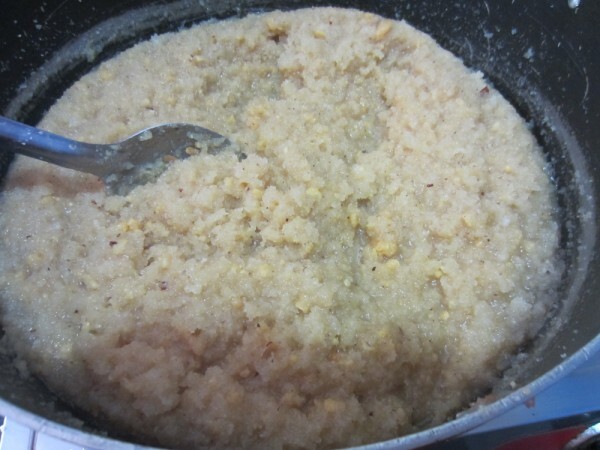 Meanwhile, microwave the khoya for 30 secs to make it a little soft. Keep on stirring till the mixture turns a light brown and is sticky. At this point the mix should not dis-integrate but should look like a light brown slightly sticky granular substance. This takes about 30 mins to get this done. Remove from heat when done. it should not be very dry. 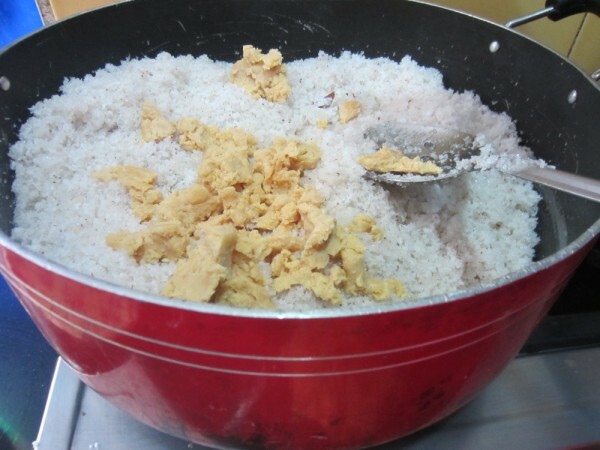 In a wide bowl, take the maida, add Sooji, rice flour. Mix in milk slowly and start mixing the batter with your hands. This way you will know the consistency of the batter. 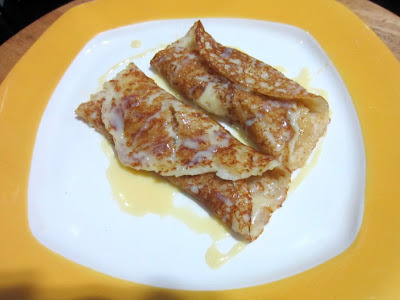 Drizzle the crepes with condensed milk and serve hot. Milk has to be slowly added when making the batter. The consistency should be thin so that it spreads when you pour over the pan and rotate the griddle to make it circle. 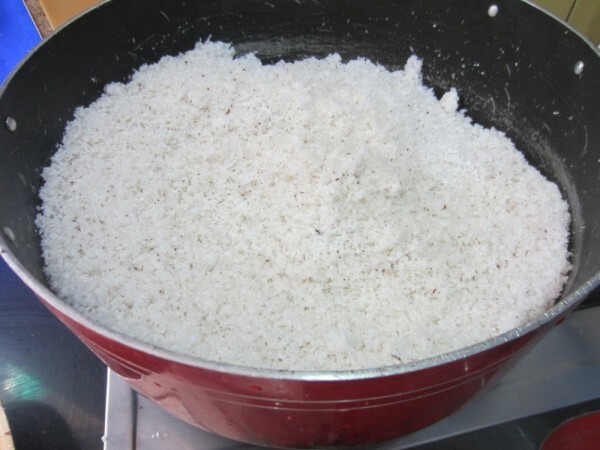 **If you do not have rice flour, you can use this measurement. 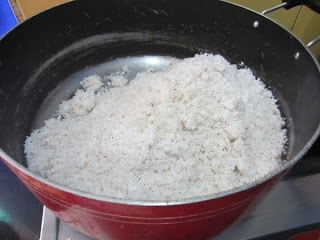 For 1 Cup Maida add 1/6th cup Sooji + 2 tsp Sugar. Add about 1&1/2 Cup of Milk and mix well to make a smooth batter. 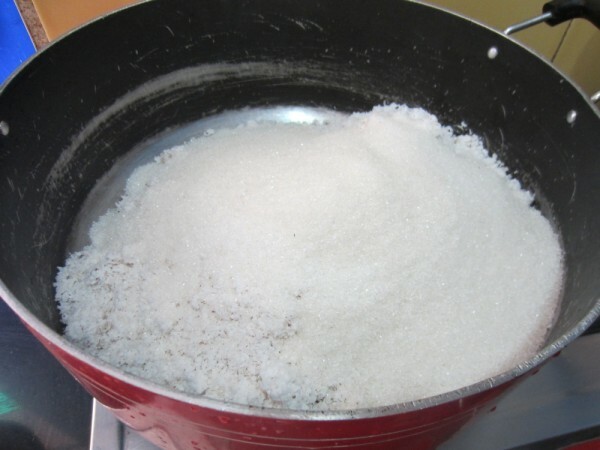 You might need to add 1/2 cup more water or milk but do that gradually and not all at once. Rest of the process is same. If you have store bought rice flour you may need to grind it once more in your dry grinder to make it fine. 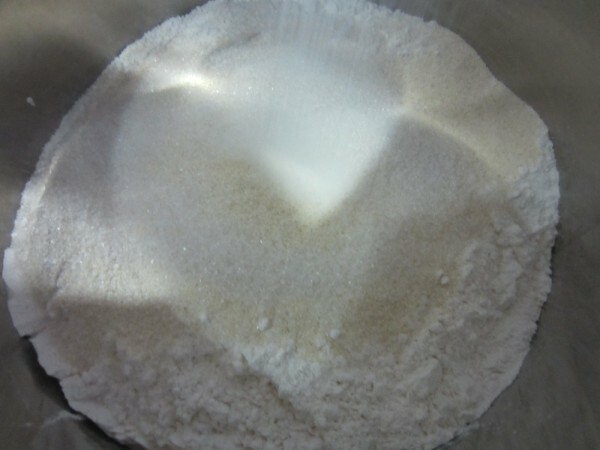 The sooji can also be ground to help the thin consistency. 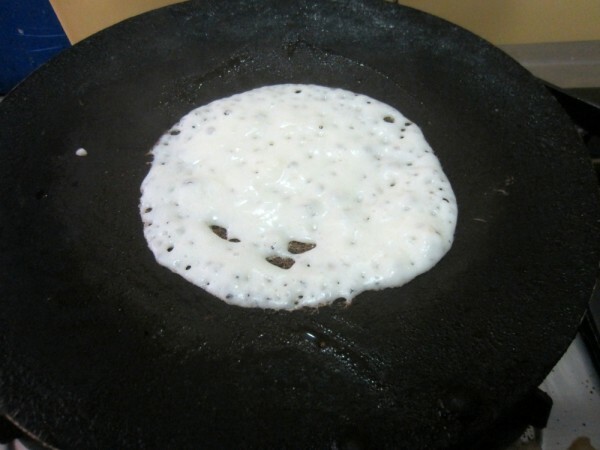 Milk to be used should not be added at one go, slowly add and blend to get a smooth thin batter. 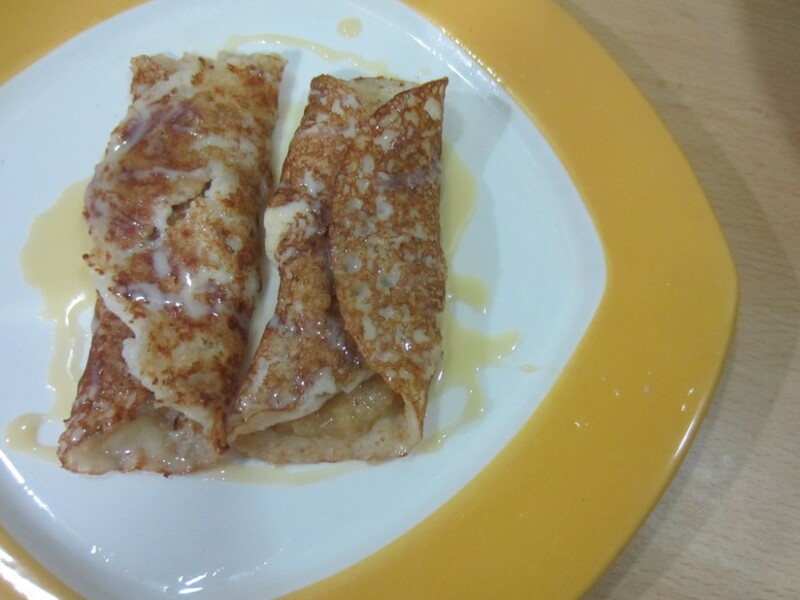 For the garnish in the end, traditionally milk is thicken and sweeten before pouring over the crepes. We can use condensed milk to get the same effect. 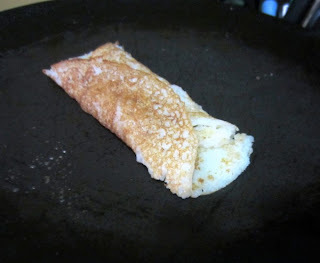 To make this healthy you can also consider using whole wheat for the crepe. turns out to be sweet as we almost caramelize the coconut with sugar. I also added a pinch of salt to the batter. To all my ICC members, please link your post to Mr. Linky.